Of course there are many ways sociology can contribute to a better understanding of what is happening online: the field is vast, and so is the number of experts and studies. This blogpost has become a series and is – more or less – an English translation of a presentation I have recently given in French, picking up a few of the theoretical frameworks which illustrate the impact of social media on the way we do business… and on our lives in general. 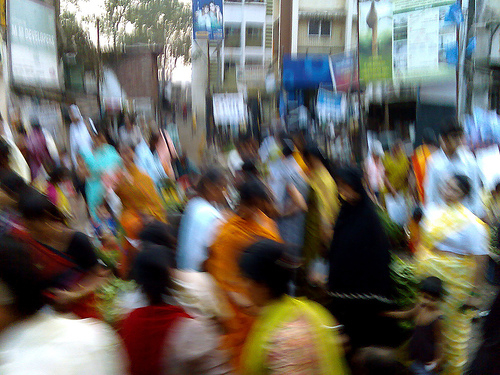 Remembering my sociological roots I have explained the impact of social media with regards to three “entities” of society – structure, culture and the individual. You guessed right: each one will make for a blogpost. The goal of the presentation was not to give an exhaustive overview but to allow for some interesting insights. This series of articles, based on the presentation, is therefore rather short on each point but covers a great range of approaches. The following points have all been brilliantly illustrated by Trisha Wang in her great LIFT talk “Dancing with handcuffs: the geography of trust in social networks. There, she also used the notions of social circles and social network and their distinction, as mentioned below. According to Trisha Wang, if we define social circles (completely unrelated to Google Plus!) as the total of ties to people we already know and trust, social networks link us to people outside of these social circles: we are interacting with many people whom we do not know yet and might never have connected with offline. (Most obvious examples are facebook friends of friends, twitter chats or Q&A sites.) For this reason, our social network is generally larger in number than our social circle as well as more diverse. Whereas our social circles consists of people with whom we interact because we trust them, with people outside of our social circle (i.e. our social network) it works differently: we build trust by interacting with them (T. Wang). This finding might seem banal, but it is important. In a marketing context, for instance, it explains why companies and brands are encouraged to engage online – nothing less. However, we do not have the same bond with everyone we interact with. And as the number of people we are connected with grows, so does the proportion of acquaintances compared to family members/close friends. The expression “strength of weak ties”, by sociologist Mark Granovetter, has been coined almost 40 years ago already and is based on the findings that weak ties are not only important but can have decisive influence if numerous. And since technology nowadays allows for even greater numbers of “weak ties” than ever before, expect societal dynamics to be modified by it! Often, the Arab Spring is cited as having been crucially influenced by the existence of a great number of weak ties online. Since social networks allow people to be in touch with countless others – beyond geographical borders, hierarchy and time – social organisation is more and more distributed and becomes less centralized. People function as networked individuals rather than group members (cf. “The Glocal Village: Internet and Community”, B. Wellman, 2004). 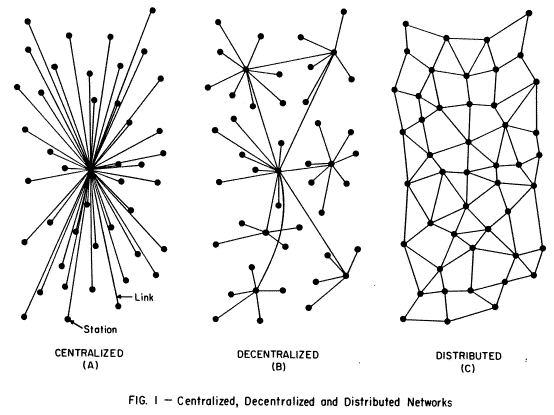 Paul Baran explained in 1964 already already how distributed networks are more resiliant and adaptive than centralized ones. Information passes quickly and reliably: when a node is weak, another node can pick up. This network property explains, by the way, why social media is often associated with values such as transparency and authenticity: in a structure where information and its spread cannot be controlled, these are transparency and “being real” is a good bet. Part 2 and part 3 of the series will (edit: never) be published in the near future.